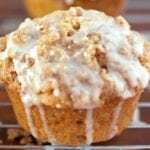 Moist coffeecake muffins topped with a cinnamon brown sugar crumb streusel and rich vanilla bean glaze. Slice vanilla bean open and scrap out inside seeds**. Place seeds into milk and let sit in the refrigerator until muffins have baked and cooled. Preheat oven to 350 degrees. Line or grease a muffin tin. Make crumb topping by mixing together all the ingredients dry ingredients. Sprinkle cold butter pieces into dry ingredients then combining using your hands until it resembles a crumbly texture. Set aside in frig. In a large bowl combine the dry ingredients for the muffins: flour, brown sugar, baking powder, cinnamon, nutmeg, and salt. Set aside. In a medium bowl combine wet ingredients for the muffins: buttermilk, butter, eggs, and vanilla. Pour the wet ingredients over the dry and gently mix until just combined. Distribute batter equally between 12 muffin cups. Sprinkle muffins with equal amounts of the crumb topping. Bake until a toothpick comes out clean, about 20 minutes. Let cool completely. Once the muffins are completely cool add powdered sugar to the vanilla bean milk until desired glaze thickness is reached. Add a dash of salt then drizzle glaze over muffins, frost muffins with glaze using a spoon or knife, or dunk muffins in glaze. Serve and enjoy! *I made my own buttermilk by combining 1 cup minus 1 tablespoon of milk with 1 tablespoon of white vinegar, stirring well, and letting it sit on the counter for 5 minutes.